The Department of Chemical Engineering at the University of Rochester invites applications to fill two tenure-track faculty positions at the assistant professor, associate professor or professor rank and are scheduled to begin July 1, 2018. Applicants are expected to have earned a PhD degree in chemical engineering or a related discipline, and candidates should offer a plan to develop an internationally recognized research program that builds upon existing university and departmental strengths. The position is open to candidates specializing in any area of chemical engineering including, but not limited to, sustainable process engineering, chemical separations, biotechnology, and advanced materials. 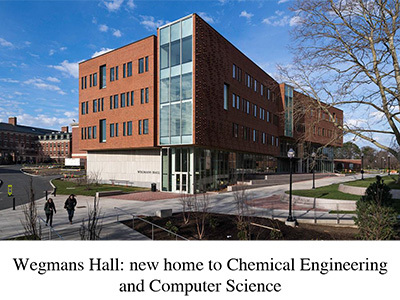 Founded in 1915, the Department of Chemical Engineering is one of the oldest in the country and contributions from Rochester faculty, students, and alumni have had global impact on the profession. The department was statistically ranked between 8 and 28 of 106 chemical engineering doctoral programs by the National Research Council rankings in 2010. The department’s prime research strengths are materials, interfaces, biotechnology, electrochemistry, and computation. The department has ongoing collaborations with Laboratory of Laser Energetics, the University of Rochester School of Medicine and Dentistry, as well as many academic departments across campus. Information about the department can be found at: http://www.che.rochester.edu. Anchoring the Finger Lakes region of western New York State, the greater Rochester area is home to over a million people, and offers unsurpassed quality of life, with a thriving arts scene, outstanding public schools, affordable housing, and a huge range of cultural and recreational opportunities. Traditionally strong in optics research and manufacturing, the area was recently selected by the Department of Defense as the hub of a $360M-plus Integrated Photonics Institute for Manufacturing Innovation. Applicants should show promise of excellence in teaching chemical engineering courses. Applications received before December 15, 2017 will receive immediate attention; however, applications will be reviewed thereafter until the position is filled. Interested applicants should complete an online application at https://www.rochester.edu/faculty-recruiting/login.